Express just how thankful you are with this HUGE Thanks! Chocolate Chip Cookie Jar. 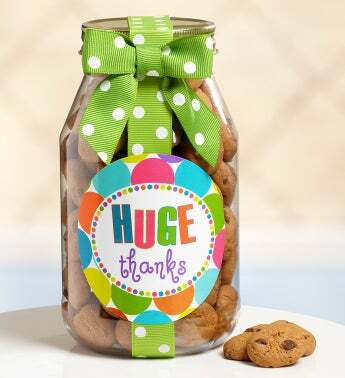 It’s filled with the tastiest mini-chocolate chip cookies they’ve ever had and packed in a resealable quart jar tied with a bright green ribbon bow covered in white polka-dots. They’ll be “thanking you” for the wonderful gift!